It’s finally starting to feel like Spring! The grass looks a little greener, the sun shines a little brighter & all the little birdies are out and about singing their songs of joy. Why not bring a little of that joy indoors? Here at Tracery birds of a feather flock together and we have all sorts of ways you can add this popular motif into your environment. 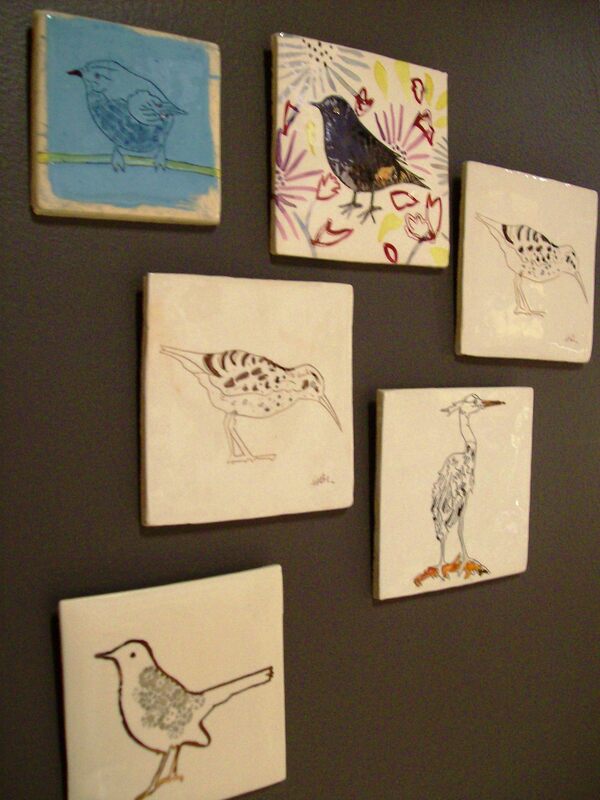 We have a variety of hand-made Bird Tiles at the moment that can be used in your home in a multitude of ways. One simple tile placed in a room adds a bit of whimsy, or add another dimension to a wall grouping. We have even had a customer use several in an indoor shower! The possibilities are endless. Each tile is hand crafted in England and they range from $70-$80 each and measure from 4.5″Sq to 5.5″Sq. This trio of bird plaques include a Cockatoo, Peacock & a Grouse. 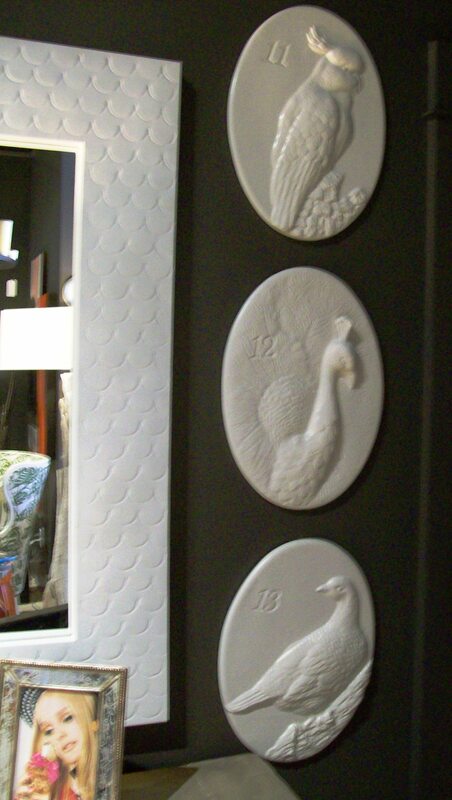 Hung individually or in a group, these porcelain wall plaques add character to a space with out overwhelming color. Each measures around 12″Wx16″L and retails at $124.00 each. Looking to set a Spring Table? 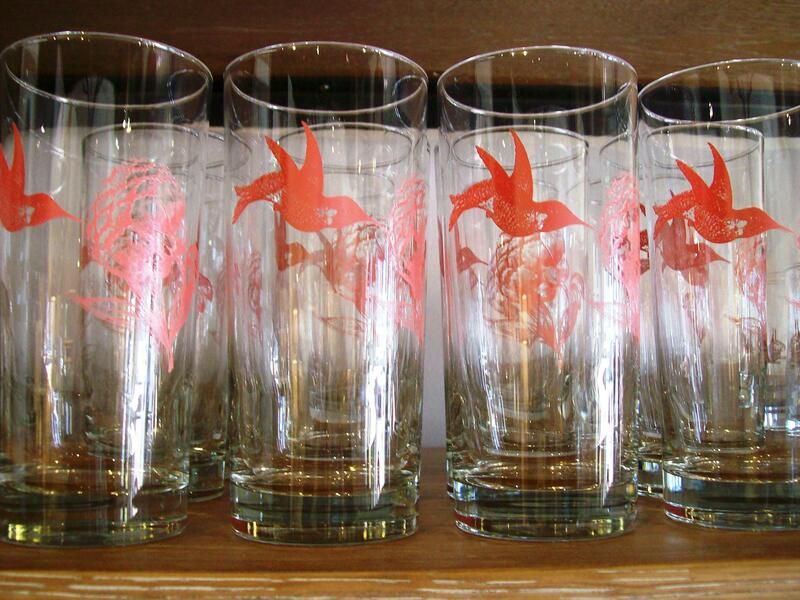 Insert our 15oz glass Hummingbird Rose Glasses & voila! Each glass is $10, making a set of 6 $60. We can ship! 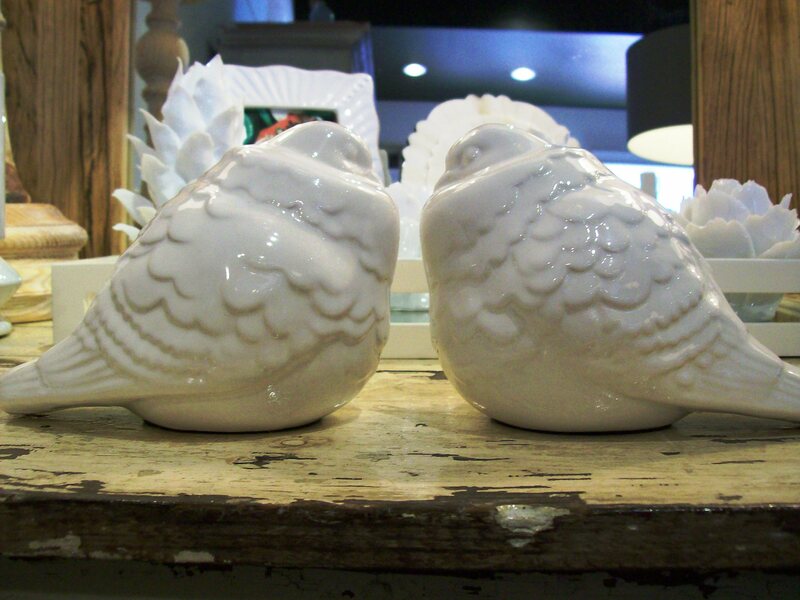 These lovely birds look great perched on a shelf or mantle. Or perhaps they are the perfect pet?! No feeding & mess free. Each ceramic bird retails at $31.00. Maybe you wish to spread your wings and send a little note to a far away friend? We have a great variety of stationary at the moment including these two sets of notecards & envelopes. 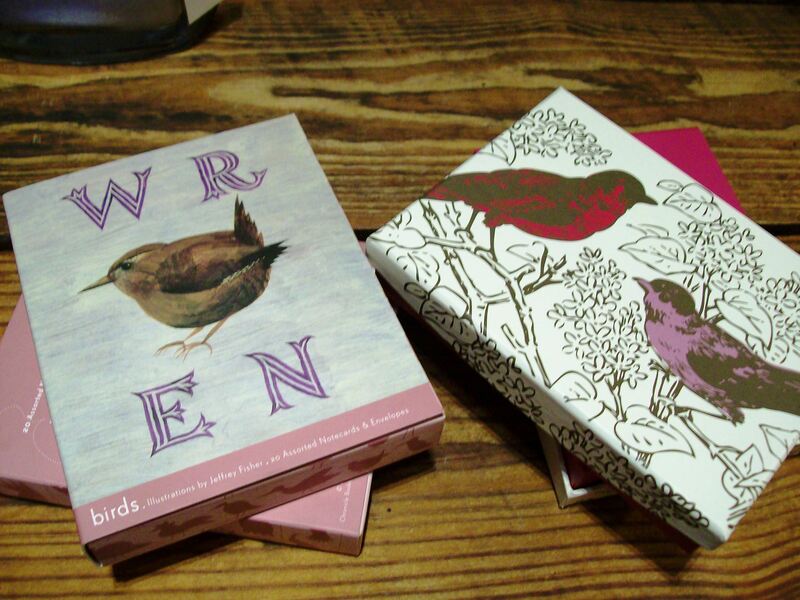 The ‘Wren’ set includes notecards that feature illustrations of the Wren, Rook, Cuckoo, Great Spotted Woodpecker & the Snowy Owl by Jeffrey Fisher. It retails at $14.95 & includes 20 Assorted Notecards & Envelopes. The pretty pair of birds is from fabric designer Thomas Paul. Each set retails at $14.00 & includes 10 Notecards & Envelopes all featuring the purple & pink pair. For inquiries feel free to call our Shop at 850.231.6755 or email us at shop[at]traceryinteriors[dot]com. Congratulations to Emily A. Clarke & Chad Moore! I have sent you both emails to get your information so I can send these out. And a big thank you to everyone that entered & shared all of their plans for their journals-we love to hear from all of you. More goodies are to be given away in the future, so stay tuned…. Tucked beneath the back stairs of a home we designed at Lake Martin is where you’ll find this well organized home office space. 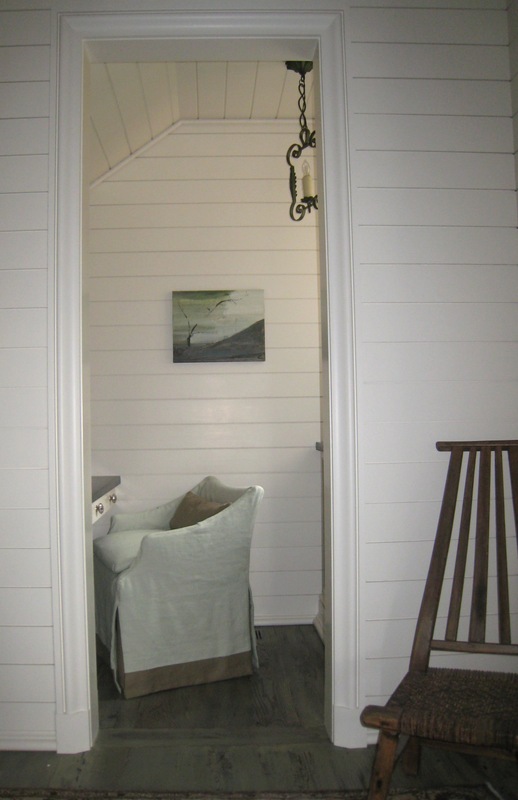 Although this is a vacation house, one of the homeowners–a busy mom–requested a place to check e-mail, take care of family business while on an extended stay and to have some space away from the communal family areas elsewhere in the home. Paige and Anna Kay worked with Birmingham-based Burnham’s Fine Cabinetry to design a series of storage cubbies surrounding a bulletin board space that tucks into the sloped area beneath the stairs. A walnut desk surface is suspended below. A built-in credenza on the opposite wall conceals a printer and provides some closed storage. Doug made a trip around Birmingham one day to collect a full range of supplies to outfit the office. Rather than hide away items like rubberbands, paperclips and post-it notes; he placed the items in glass jars with latching tops. Small hanging tags keep everything labeled and in the proper place. In the top cubbies Doug tied bundles of envelopes with twine and placed a distressed metal box from our shop in the center. These fun glass jars are from World Market. We love their classic look and think they are great for storage in kitchens and pantries and that they look equally as good in an office setting like this. Once, we even filled them with pebbles and votive candles and used them to decorate tables at a party for a lake home development. A very versatile find–and available in several sizes! At our Rosemary Beach studio and shop it’s been clear for a couple of weeks now that spring has finally arrived. 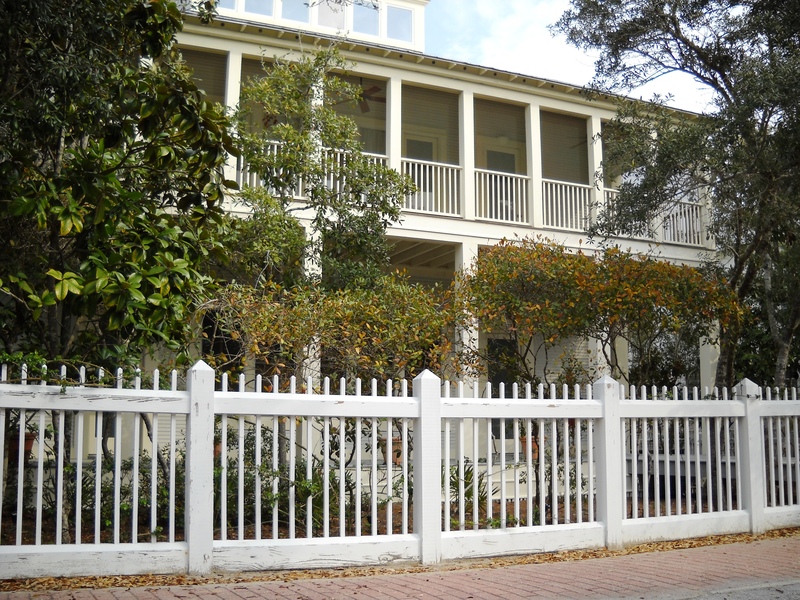 The streets of Rosemary Beach are once again busy with visitors who have come to enjoy the beautiful beaches of the Scenic Highway 30A area. Paige, Anna Kay and Bess have enjoyed meeting so many blog readers who’ve stopped by our shop already this season…if you haven’t made our way yet, please be sure to stop by and say hello when you do! At our other design studio in Birmingham, one of the coldest winters anyone can remember is finally giving way to a beautiful spring. Inspired by the soft pink hues of the tulip tree blooming in Doug’s front yard, here are a few rooms from our portfolio which display the soft colors of springtime. This bedroom in a home we designed at Lake Martin is full of the soft pink and white tones that signal the start of spring. The pink linen drapery bring subtle color the white-painted planked walls. The Oly Studio bed features rafia-upholstered panels which partner with the jute rug to add texture to the space. Coincidentally, the subject matter of the Justin Gaffrey piece Paige and Anna Kay selected to hang over the bed is one of our favorite spring flowers–daffodils. If you haven’t already left a comment to be entered to win a journal from our shop, covered in a fun Thomas Paul print, make sure you do. The contest ends Sunday, March 28 at 7pm central. Have a great weekend everyone — enjoy the spring weather! Have you noticed a lot of tufting going on lately? We sure have. It seems all the design blogs we read are flush with tufted pieces of furniture. For those unfamiliar with the term, tufting refers to an upholstery technique where a button is pulled tight into a batted surface, creating an impression around the button. A series of buttons applied in this manner creates a “tufted” surface. Doug recently designed a custom-made tufted headboard for a house in Mountain Brook, Alabama. Covered in a slubby white linen, the tufted surface of the headboard is a textural contrast to the smooth linen coverlet and buffed venetian-plaster walls, all in the same tone of greyish white. We had this piece custom fabricated, inspired by an image from a page ripped from an old issue of Southern Accents that our client had in her inspiration file when we began the project. Doug took the concept of the inspiration image and raised the height of the headboard to balance the height of the vaulted ceilings in the room. You can’t tell from the picture because of the bed pillows, but our upholstery shop worked with the specific dimensions of the mattress our client had purchased to ensure that the last line of button-tufting fell just above the top of the mattress. Now that’s custom! We love the old school style of the piece, and the shiny nailhead trim that runs down the front of the arms. The two cushion seat and button tufted back and sides are a fresh take on classic Chesterfield Sofa style. We love using ottomans as coffee tables because they create such a great place to literally put your feet up and relax! Everytime we put one in a house with kids, they inevitably end up laying in the center of the piece as soon as it’s carried in the house! The solid lower shelf on this piece creates a great place to stash magazines and games while keeping clutter out of sight. The classic turned legs are accented with a row of nailhead trim. Paige and Doug just placed this chair, upholstered in crisp white sailcloth, in a little girl’s room in Birmingham. The small stature of this piece (28″ w. x 36″ d. x 34″ d.) makes it a great bedroom piece and the all-over tufting and turned legs with casters add a classic touch. Originally designed by legendary architect Ludwig Mies van der Rohe for the German Pavilion at the 1929 International Exhibition in Barcelona, this piece is one of the hallmarks of classic contemporary design. The linear arrangement of the button tufting creates a much more structured and crisp appearance than the diamond tufting found in more decorative examples (see the Lee chair above for contrast). We love it in classic and dressy black, or clean and fresh white leather. Thomas Paul Journal GIVE AWAY! Thomas Paul has become a Tracery Shop staple in the last few years. We always have several of his quirky accent pillows on hand and have recently re-upholstered a vintage chair in his fabric as well, which you saw [here]. Now everyone can have a bit of his fabulous fabric design…no matter the location! 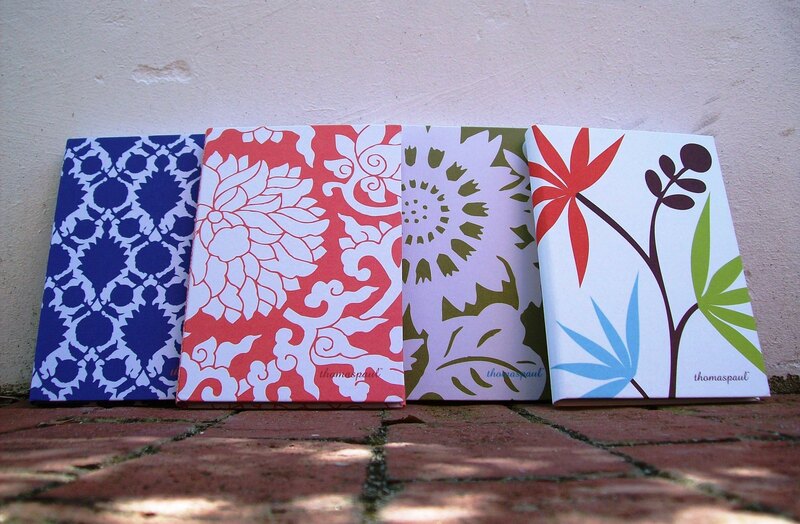 We are excited to now carry the Thomas Paul fabric covered journals in 4 beautiful prints: [L to R above] Flock, Blossom, Zinnia & Palm. 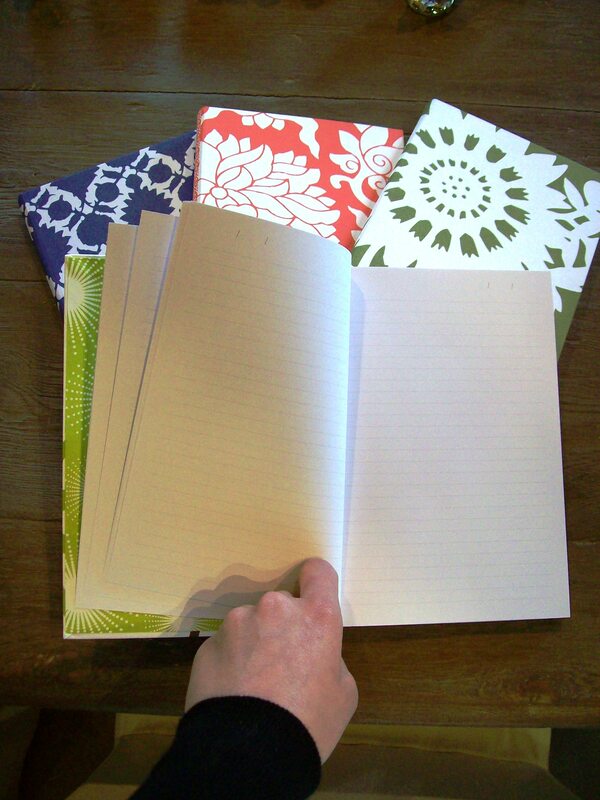 Each journal measures 6″wide and 8 1/2″long. All pages are lined. To enter our giveaway you must comment on this post between today & Sunday, March 28 at 7pm. What would you do with your journal? Give it as a gift? Use it as a guest book? Keep it full of life’s secrets….let us know! We will be choosing TWO winners, so be sure to leave us your email address and we will contact you for pattern preference. Bess will be announcing the winner on Tuesday. Good Luck!